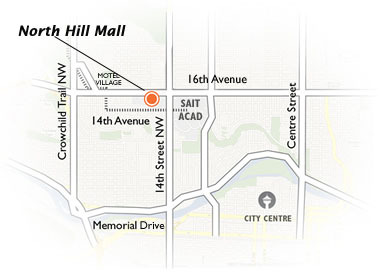 North Hill Shopping Center is on the Trans Canada Highway 16th Avenue between 14 and 18 Street NW. Direct access to the Professional Office is available from the south parking lot off 14th Ave. The entrance is adjacent to the CBI entrance east of the high rise condos. Wheelchair access is available through the mall elevators located west of the old SEARS, between Telus and Freedom Mobile. The Lions Park LRT station is just outside the Southwest entrance on 14th avenue and 19th Street . If you have any questions or trouble finding our clinic, please do not hesitate to contact us – (403) 284-9323.